The Military Ocean Terminal Sunny Point Joint Land Use Study (JLUS) is a project funded by a grant from the U.S. Department of Defense Office of Economic Adjustment (OEA) and administered by the CFCOG. Benchmark Planning has been hired as the consulting firm leading the JLUS process. Military Ocean Terminal Sunny Point (MOTSU) is the largest military terminal in the world, the key ammunition shipping point on the Atlantic Coast, the Army's primary east coast deep-water port, and one of a handful of Department of Defense terminals equipped to handle containerized ammunition. It serves as a transfer point between rail, trucks, and ships for the import and export of weapons, ammunition, explosives and military equipment for United States Army and is operated by the 596th Transportation Brigade. The Project’s primary goals are (1) to protect and preserve the military- and defense-related operational capabilities of Military Ocean Terminal Sunny Point (MOTSU), the nation’s and world’s largest military terminal; (2) to support continued and safe growth and economic development of MOTSU’s neighboring communities; (3) to enhance communication and collaboration between military commanders and local officials; and (4) to establish policies and procedures for managing compatible land uses adjacent to and encroaching on MOTSU. 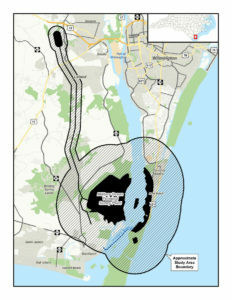 The proposed study area includes an approximate 3-mile buffer around the MOTSU facility and a ¼-mile buffer of the MOTSU rail corridor and yard and covers portions of Brunswick and New Hanover Counties, including the City of Boiling Spring Lakes, the Town of Carolina Beach, the Town of Kure Beach, the Town of Leland, and the City of Southport. MOTSU is located in one of the fastest growing regions in North Carolina. MOTSU’s main operations are located in Brunswick County, the fastest growing in the state according to the NC Office of State Management and Budget. MOTSU’s boundaries cross the county line into New Hanover County where a portion of the blast zone abuts growing ocean-front communities as well as significant State-owned lands containing significant tourist attractions like Carolina Beach State Park, Ft. Fisher Aquarium, Ft. Fisher State Historic Site, Ft. Fisher State Recreation Area, and the Ft. Fisher-Southport Ferry. Additionally, the US Air Force Ft. Fisher Recreation Area is located within the MOTSU boundary, as is the Kure Beach and Carolina Beach sewer treatment plants and Dow Road, a regional arterial road and a major bicycling route. As a result, the project study area contains a rapidly growing population and a significant seasonal tourist population. The project will open lines of communication between MOTSU commanders, local officials, and key public and private stakeholders, who will work collaboratively to achieve the project goals identified above. The State of North Carolina has made it a priority to protect the continued operation of its military facilities and this project will help in that effort while also accommodating the growth in population and tourism in the area. The Joint Land Use Study process will be supervised by a Policy Committee comprised of elected officials from the participating local jurisdictions, as well as representation from the State of North Carolina and MOTSU. An Advisory Committee of state and local government staff and MOTSU civilian staff will provide support for the project and recommendations to the Policy Committee. For more information, contact project manager Allen Serkin at [email protected] or at 910-395-4553.